BEST Low Carb Cheesecake Recipe - Keto and Sugar Free! Low Carb Cheesecake that’s as close to the original version as you can get but without all the guilt! 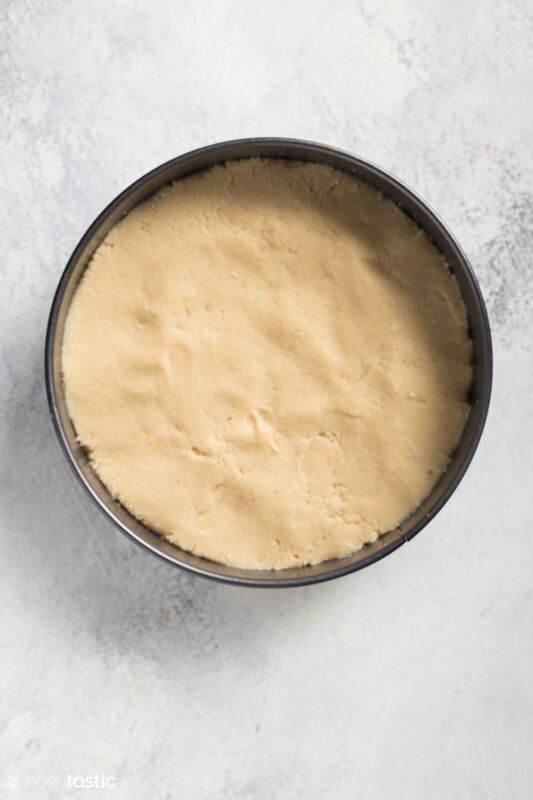 My keto cheesecake recipe is very simple to make and I’ve included a couple of quick and easy steps to help you get the smoothest, most velvety cheesecake texture so you won’t even miss the sugar. This is an adaptation of a cheesecake recipe I’ve been making for years, I think you’ll love it! It’s low in net carbs at only 7g per slice which is hard to believe for such a decadent sugar free cheesecake, but it’s the real deal! And if you want to top if off with a few berries and some whipped cream be my guest, they complement it very nicely and work well on your ketogenic diet. There are several ways to make cheesecake, there are baked recipes and no bake recipes, but my low carb cheesecake recipe is cooked in a water bath which sounds intimidating but it’s really easy to do and ensures that you get an even bake and a smooth top on your keto cheesecake. If you’re wondering if you can bake it without the water bath, well, yes you can, but you risk having it crack on the top and it may not cook quite as evenly. Preheat your oven to 350F first and take out all your ingredients from the fridge to get them to room temperature, the cream cheese especially needs to be soft enough to mix or you will end up with large chunky cheese bits in the topping mixture. 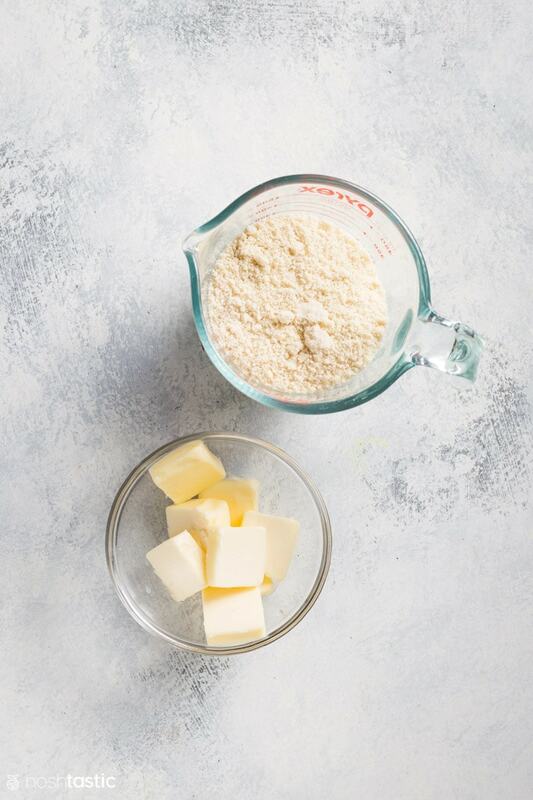 Go ahead and mix the softened (or melted) butter and almond flour together in a mixer or a food processor, then press it into the base of a parchment lined cheesecake pan. You can use a push pan like I have here, or a springform pan, either works well. In order to get a lovely crack free top on your cheesecake, and a smooth, evenly baked and creamy center we are going to cook this in a water bath, it’s a lot easier than it sounds! All you need is some wide heavy duty aluminum foil to wrap up around the sides of the cheesecake pan like you see in my photos, this prevents water seeping in the bottom. Use one single large piece of wide heavy duty foil, I used wide foil and that easily wraps around the pan in one piece. If you are using regular aluminum foil to wrap the cheesecake pan then I suggest using a double layer because if it tears you will get water seeping into your low carb cheesecake crust, and that will be a disaster! It’s easiest if you wrap the cheesecake pan before you bake the cheesecake crust as it will be difficult to do when it’s hot. While you’re waiting for your low carb cheesecake crust to cook you can start putting together the low carb cheesecake topping ingredients. 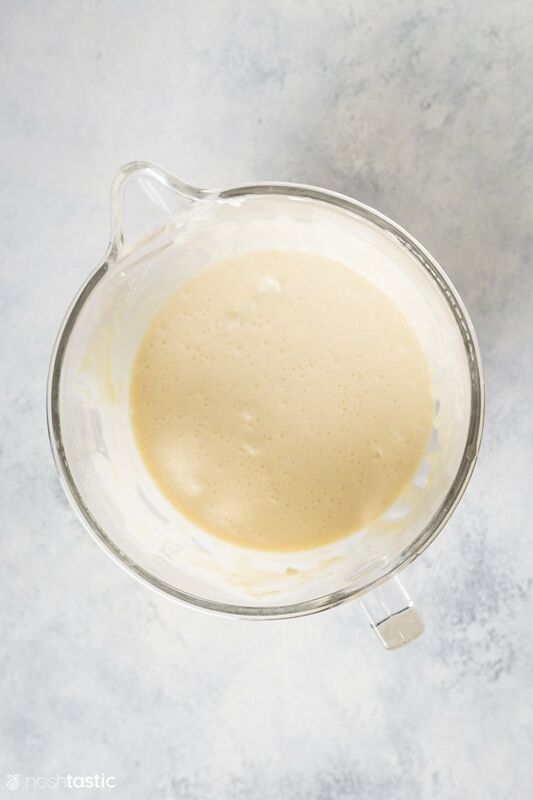 The first thing you need to do is beat the cream cheese in a mixer until soft, as I mentioned already it really needs to be softened and at room temperature so that you can easily mix it. Then, add your favorite granulated or powdered low carb sugar substitute, eggs, egg yolks, vanilla and lemon juice and blend until thoroughly combined. Don’t forget to scrape down the sides of the bowl to catch all the unmixed bits of cream cheese. Now boil water for the water bath. Put the pre-cooked keto cheesecake crust inside the larger pan for the water bath, I just used a high sided roasting pan, and then pour your low carb cheesecake filling over the crust. Place the pan on the middle shelf of your preheated oven and carefully pour in the very hot water around inside the water bath to about half way up the side of the cheesecake pan. Bake your Keto Low Carb Cheesecake for about 45-55 minutes, it will depend on the temperature of the oven exactly how long it takes but you want it to be set around the edges and just very slightly jiggly in the middle. Whisk the sour cream, low carb sweetener, and vanilla together and pour over the top of your keto cheesecake and carefully smooth out with an offset spatula. Return the cheesecake to the oven and continue to bake for a further 10 minutes, then remove from the oven. Carefully remove the springform pan from around the edges of the keto cheesecake, or if you have a pushpan you can run a knife around the edges. Its best to let it fully cool, overnight if possible, before you serve it. You can serve your keto cheesecake topped with whipped cream and berries if you like. Low Carb Cheesecake sliced and ready to eat! Best Low Carb Sugar to use for Keto Cheesecake? 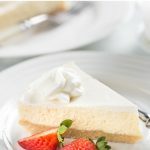 There are several different types of sugar substitutes you can use for this low carb cheesecake recipe, but there are a couple of things to bear in mind before you get started. The first is that the amount of low carb sugar in this recipe has added some bulk and volume to it, so if you wanted to replace it with stevia drops for example, then the texture of the cheesecake may be quite different as you are removing about a cup of the low carb sugar but replacing it with something that essentially adds no bulk or volume to the recipe. Also, as you’ll know if you’ve been on a Keto or low carb diet for any length of time, different low carb sugar replacements can taste quite different so it’s important to know ahead of time if you actually like the taste of the one you eventually decide to use. Is Erythritol the same as Stevia? Can you eat Low Carb cheesecake on the Keto Diet? 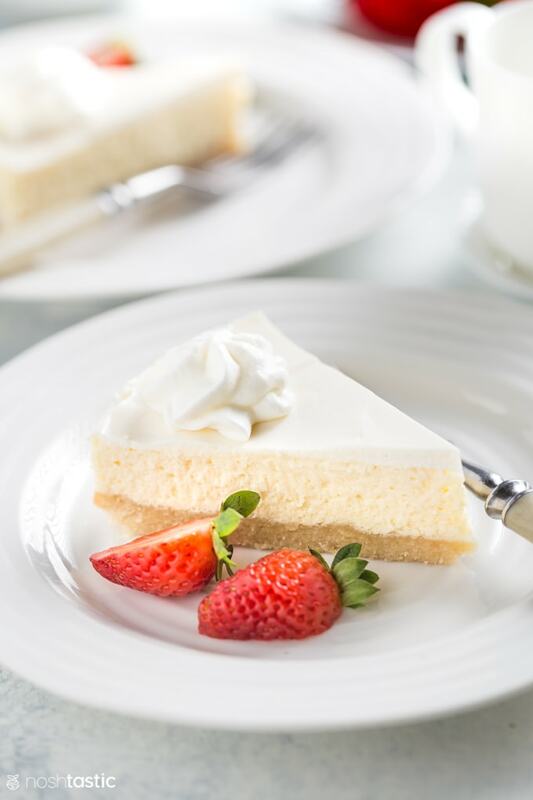 If make it with the right ingredients as we have done here, then yes, a slice of low carb cheesecake now and then can form part of your Keto diet and is a great treat that even the non keto members of your household will enjoy! 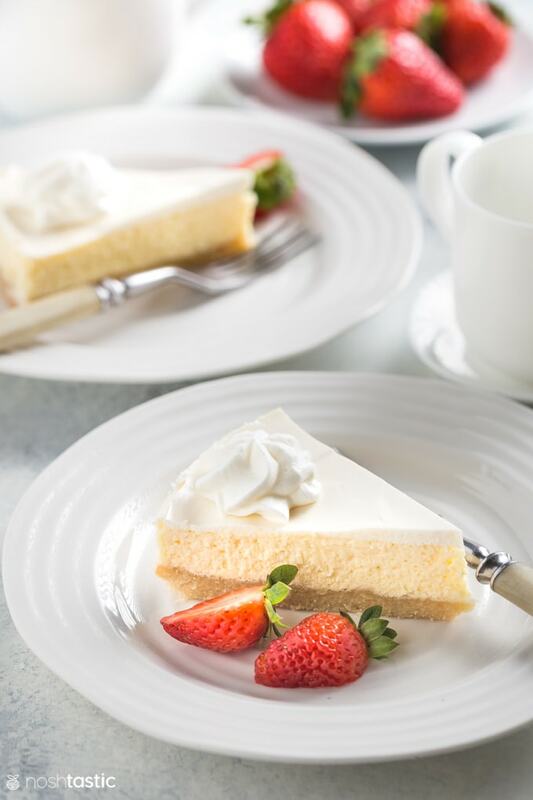 We used almond flour for the crust along with butter, both keto diet staples, and we used and erythritol and monkfruit blend sugar substitute to sweeten the cheesecake layer which means that the carb count is much, much lower than a regular cheesecake recipe. How Many Carbs in Low Carb Cheesecake? This keto cheesecake recipe will make approximately 8 slices and has 8g carbs and 7g net carbs per slice. If you make smaller or larger slices then it goes without saying that the amount of carbs per serving will then be different, we also didn’t count the carbs from the erythritol (sugar alcohol). If you serve it with whipped cream and berries the cream will increase the calories and fat content – which is fine for keto – but the berries will also add a few carbs, but not many if you only have a few. A decadent treat, this Keto low carb cheesecake recipe is sheer perfection. Pulse the butter and almond flour in food processor until combined. Line the bottom of an 9 inch springform, or push pan, with parchment paper. 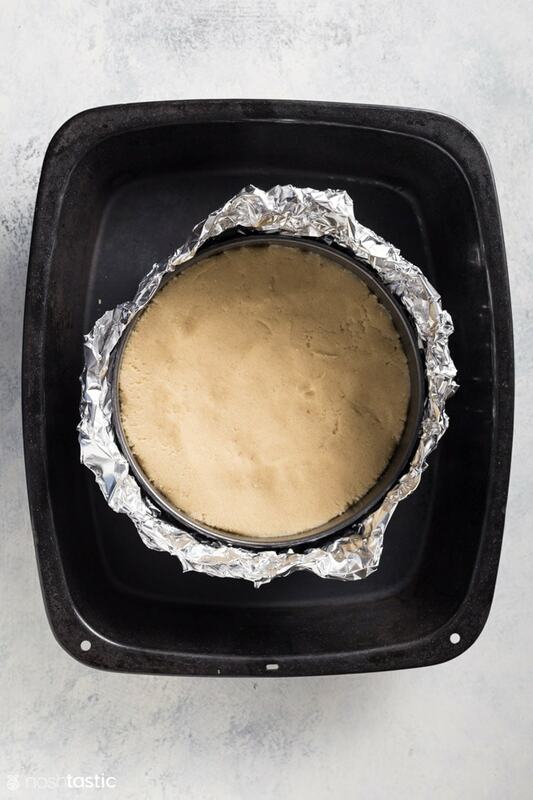 Line the outside of the cheesecake pan with heavy duty aluminum foil (see photo in post) so that it covers the bottom and sides in one large piece if possible. If you are using regular foil then use two pieces just to be safe. This will protect the cheesecake from the water as it is cooked in a water bath. Carefully press in the mixture for the cheesecake crust into the pan and bake in the preheated oven for 12 minutes. You will need three 8oz packs of cream cheese, you'll be using two whole packs plus two thirds of the other packet for a total of 21oz or 600g of cream cheese. 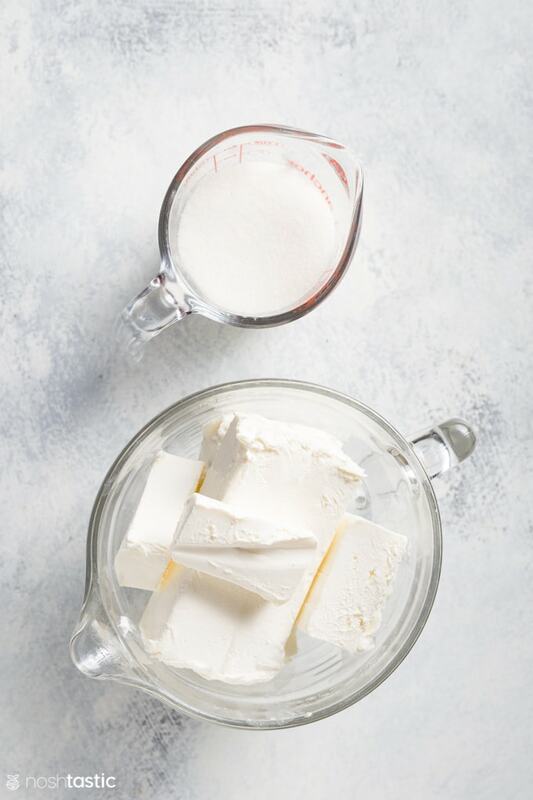 Beat the softened cream cheese gently until it's smooth, then add the low carb sugar substitute * Beat in the eggs and egg yolks, then finally the vanilla and lemon juice. Boil enough water to halfway fill the roasting pan around the cheesecake pan. Place the cheesecake into the roasting pan and then pour the low carb cream cheese filling over the already cooked cheesecake base. Place the roasting pan with the cheesecake pan onto the oven shelf and then pour the recently boiled and still very hot water into the roasting pan around the cheesecake. It should come about halfway up; don't overfill as it will be difficult to lift the pan. Cook for 50 minutes. Once cooked it should feel set around the edge, but with a little jiggle in the middle. If it's too soft the sour cream topping will not sit on the top. 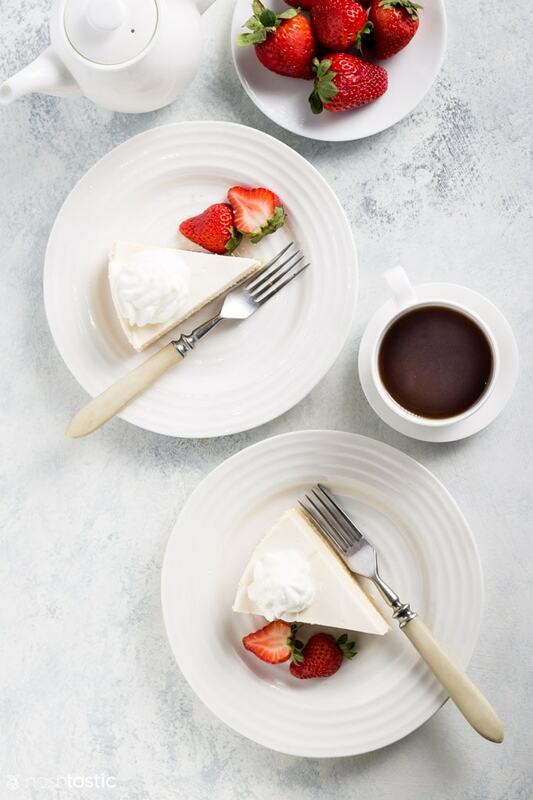 Whisk the sour cream, low carb sugar substitute, and vanilla for the topping and pour over the cheesecake and smooth out with an offset spatula. Put it back in the oven to bake for a further 10 minutes. Take the cheesecake out of the oven and very carefully remove the Springform pan from around the edges and stand it on a rack to cool. When it's cooled down completely, put it in the fridge. Serve with whipped cream and berries if desired. To get a smooth cut on your pieces of low carb cheesecake, run a sharp knife in very hot water, dry it, and then immediately cut a slice. 7g net carbs per slice, assuming 8 generous slices per cheesecake. Nutrition information below does not include sugar alcohol low carb sweeteners.